It has been a glorious Easter weekend here in France's second-sunniest département. Brilliant sunshine bathing cheery throngs of locals and holiday makers, all flocking to bustling fairs and markets; to La Rochelle where l'Hermione is preparing to depart on her much-anticipated Atlantic voyage; and to the golden sands of Châtelaillon-Plage, where the cobalt skies this weekend have been splashed with riots of colour by a myriad of soaring kites during the three days of the 22nd Festival du Cerf Volant. Kites, sails, windsocks and whirly-gigs of all kinds delighted visitors to this beautiful stretch of the Atlantic coastline throughout Easter weekend. Too many to count and all simply begged to be photographed! It's not every day you see a penguin on the beach in Charente-Maritime! 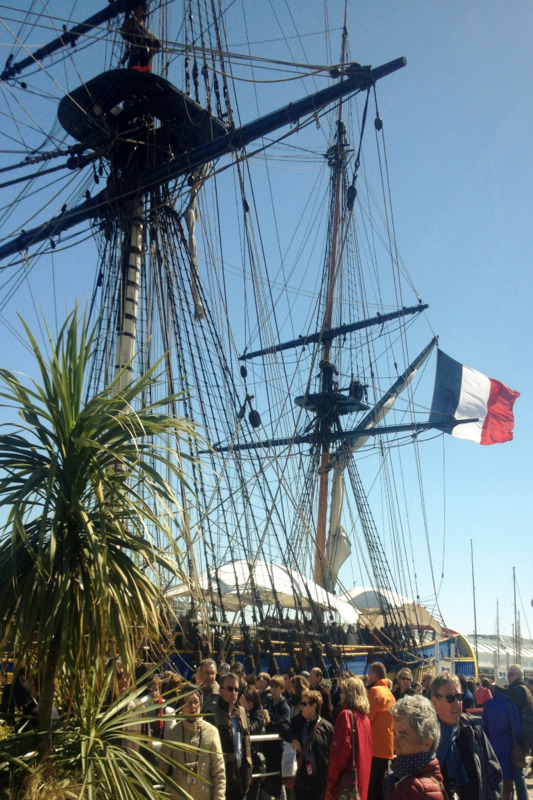 L'Hermione, is a magnificent replica of the tall ship which began her historic crossing of the Atlantic on March 10th 1780 from the very place her successor is currently berthed in the vieux port of La Rochelle. Over the entire Easter weekend, jazz bands, shanty-singing mariners and enthusiasts in period-costume have mingled with the enthralled visitors, all hoping to capture the spirit, take photographs and celebrate the triumph of those who have played a part in building and preparing this majestic vessel before she sets sail on her epic journey later this month. Bon vent et bon voyage! We are truly blessed to have such gems on our doorstep, with interesting events and activities going on all year round. Why not share them with us by booking a stay here at Rue Vincent? Check out our availabilty and book your visit today. We would be delighted to welcome you! © Copyright 2018 Jacqueline Berry at Rue Vincent unless otherwise accredited. All rights reserved.